A TIME TO BE BORN . . . The word of God was spoken and Mrs. Rosie Lewis Polk came forth. 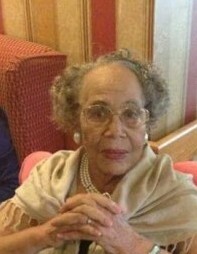 She was born November 27, 1923, the first child of the late F. L. Lewis, Sr. and the late Velma Ballard Murphy. During her ninety-four years and nine months of living her life, she had many experiences and touched many lives. Both her parents and a stepfather (Mr. Rent Murphy) whom she came to love as her own father preceded her in death. Two loving sisters and three brothers also preceded her in death. At an early age, she professed her faith in Jesus Christ as her Lord and Savior and joined Maze Hill M. B. Church in Hickory Valley, Tennessee. She later was a member of Hunts’ Chapel Church and Hopewell M. B. Church in Grand Junction, Tennessee. Upon moving to Bolivar, Tennessee in later years, she became a member of New Bethel Missionary Baptist Church where she attended regularly and served as a Mother of the church until her health limited her ability to attend. She attended school in Hardeman County until the eighth grade when her father became ill and passed away suddenly. After the death of her father, she had the responsibility of helping her mother to gather the crops and care for her younger siblings. A TIME TO PLANT . . .
A TIME TO DIE . . .
At ninety-four years and nine months, she lived an amazingly blessed life. On September 1, 2018, God spoke once again closing her tenure here on earth at 9:50 a.m. at Pinemeadows Healthcare. She was surrounded by family. She leaves to cherish her memory: a brother, Willie Murphy, Jr.; eight children, Lee L. Polk (Elena), Ruby Ruffin (Theodore), Joe Frank Polk (Doris), Robert Nelson Polk (Cleo), Helen Messenger (Glen), Thomas Polk (Mammie), Shirley Dickerson (Luzon), Robert Benny Polk (Ruth); twenty-six grandchildren; fifty-nine great grandchildren; a host of great-great grandchildren; a sister-in-law, Aggie Lewis; and a host of nieces, nephews, and cousins. Called before Mrs. Rosie’s tenure were grandchildren: Andrewnetta Polk, Cheryl Ruffin Thomas, Baby Elijah Neely, Almeko Woods, and Victor Robinson; grand daughter-in-law, Linda Ruffin and special son-in-law, Theodore Ruffin. We all loved her, but God loved her best.